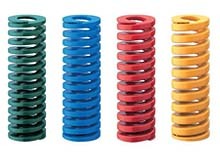 Die Springs from China manufacturer, we manufacture full line die springs both in Oil-tempered and chrome-alloy material, rectangular shape in different color for different load. Material 60Si2Mn, 55CrSi, 50CrVA etc. Color Green, Blue, Red, Yellow, Brown etc.